Feathers and Berries goes Octagon! 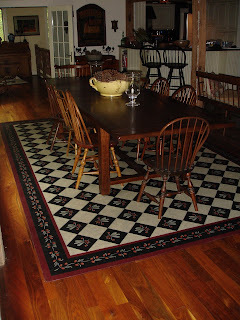 A great Octagon going to Md to a very sweet Bungalow. wide border. The lighter squares are a rag off textured effects which gives the floorcloth a lot of depth . we have highlights on the design motifs and the berries. Thank you for sharing Sam.